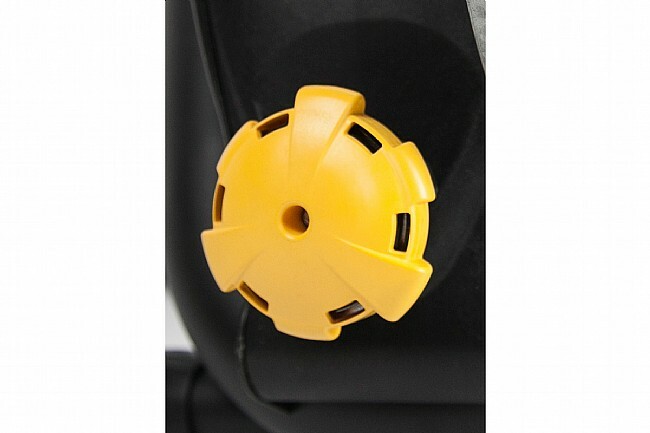 Tired of spinning your wheels all winter? Spin 'em on this trainer, and you'll be getting somewhere. The Cycleops Fluid 2 Trainer is one of the most advanced trainers available, offering a varied workout with an amazingly realistics road feel and extended durability, backed by a lifetime warranty. Just like when you ride outside, all you have to do to increase or decrease resistance is change gears. A carefully-engineered resistance unit is encased in hydraulic fluid, for a quiet ride and realistic resistance response. PowerTuned technology, the product of scientific and athletic collaboration, results in a trainer that allows your wheel to accelerate and decelerate on an infinite resistance curve, just like it does on the road outside. Sturdy steel construction and adjustable footpads make for a stable, reliable ride no matter what surface you're setting up on. 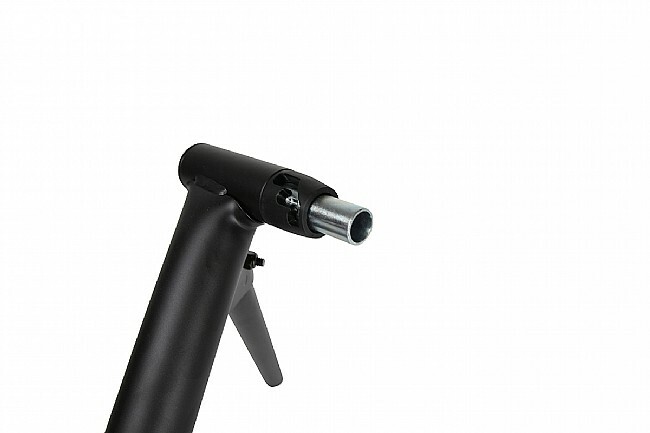 Quick-load cam lever lets you immediately return to the resistance level of your last ride. When you're done, fold it up for easy storage. Leak-free construction and unique self-cooling technology ensure this trainer can withstand a rigorous daily training routine, season after season. Made in the USA. I'm training for my first Triathlon and where I live we get a cold enough winter that you'd avoid biking outside. This trainer has allowed me work on my bike fitting, riding form, pickups, hills, you name it. I ride on this trainer at least 1 hour, 3 times a week. THe Cycleops Fluid 2 Trainer came in its original box, and was very easy to assemble, about 10 minutes. No excuse not to train during winter. I use the trainer daily for 45 minutes. The trainer is quiet, durable and reliable. I am glad that I purchased the trainer. I bought the Fluid 2 from Western Bike Works because they had the best deal going at the time. The trainer was pretty easy to setup. It took me about 5-7 minutes and most of that was making sure the one bolt was tightened completely. The trainer is very quiet compared to magnetic or wind based trainers. I usually watch TV when I ride the trainer. To illustrate the noise level - when I'm sitting on the couch the volume level on my TV is 18-20. When I'm on the trainer it is 25-28. It's very easy to setup the bike and take it off. Bike feels secure when in the trainer. This is my first trainer. I was surprised how quiet it is. My wife can sit on a couch next to me and watch television. Assembly was easy for me but agree with some reviewers that the written instructions are not clear. It feels like the road so long as you are seated. Standing out of the saddle is not as realistic, however, since 90 percent of road cycling is in the saddle it is a minor problem (which I assume is a characteristic of all trainers). This is the second Fluid 2 I've bought. It's a great trainer. It's as quiet as a trainer can be, too. Super smooth rolling. Installation of bike is easy. The turn buckle that raises the flywheel to the rear wheel of the bike for resistance is a bit odd compared to the older design I had, but it's a minor personal aesthetic complaint. If you're looking for a great, quiet trainer... this is it. As advertised, the trainer is smooth and solid. The trainer is for supplemental training for non professional tri-athlons. I use this trainer for indoor riding mainly during bad weather. It is smooth, solid and allows for long ride training, interval and hill simulation. It is used 2-3 times a week. There are more expensive bike trainers, but I couldn't be happier with its ease of set up and overall operation. I hope it is durable in the long term as well. I recommend the Cyclops Fluid 2. I absoultly hate to ride in the cold. The Cycleops Fluid 2 keeps me in shape during the less desirable riding times of year. A few minutes after the shipment arrived, I had it assembled and my rig mounted. I have found the trainer to be very stable and I enjoy the resistance the unit applies the harder one trains. A must have for any serious cyclist. I started with a cheaper trainer that made so much racket I couldn't hear my Ipod with ear buds, even though it was described as quiet. This trainer really is quiet. It is simple to set up and provides a good, road-like, workout. No problems after 3 years. I bought another one for my son. Love it.Western Bike works has the best price I could find on-line. And free shipping to boot !! It's great to ride your own bike during Michigan's winter months. Works with my older cheap bike, too. Maybe Santa will help me with an upgrade ?? This is my first trainer and I'm sold on it. Several colleagues recommended this model and I'm glad I followed their advice. You won't be sorry. Easy to set up and easy to use. Couldn't be better! My sister-in-law and I decided to take a triathlon training class, so needed bike trainers. Our coach told us this was a great brand so we went for it. It was very easy to set up and we are both very pleased. We have at least 30 people in our class and our trainers are the nicest ones there. Several of the class noted the trainer and were envious. ) I have done a fair amount of cycling in the past, but this adds another element that I can do it at home on my own bike for training when we can't ride outside. With more bike races and triathlons in our future, I'm so thrilled with this product. It is very quiet in operation and does feel very much like riding on the road. I also recommend buying a lift for the front tire to level the bike when using the trainer. Upon reading many positive reviews and personal comments from fellow riders, I decided on this trainer given the great deal it was advertised at. It did not disappoint... runs extremely quiet and the fluid resistance replicates road feel as close as a trainer could do. Easy to assemble, easy to store, and easy to adjust the resistance with a sturdy handle that offers no ambiguity. The overall construction is sturdy and when the bike is installed on the trainer you feel confident and secured. For a little extra, fluid is the way to go. I have a new road bike with clip-in peddles that I bought in November. The trainer was the best investment I could have bought to familiarize myself with my new bike. I'm a novice with a Ferrari of a bike! The Fluid Trainer is smooth, it feels like I'm riding on a road (without the potholes). It is solid and well made, easy to put my bike in and out quickly. It's a great way to train when the weather is bad. The Fluid 2 is a great choice over other models I looked at, well worth the investment. I have never had such a great work out on a stationary bike before. I would recommend it thoroughly to any one at any level. The price point, the quality and the ease of assembly make it a great product. I wanted something that would allow me to ride my bike in the rainy NW weather. This trainer has turned out to be easy to set up, easy to use, reasonably quiet and best of all, enjoyable to use looking out the window at the rain and snow. 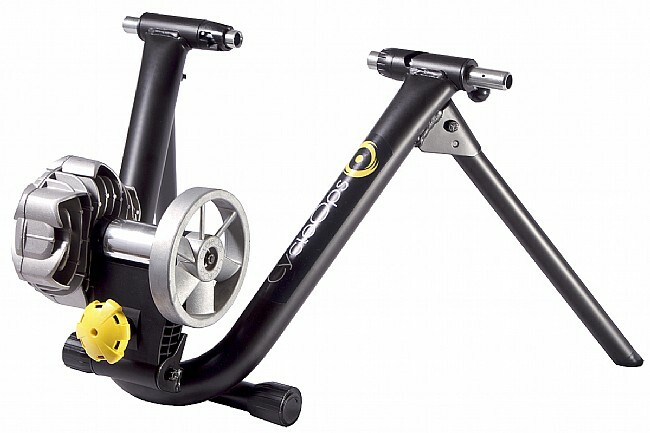 The Cycleops Fluid 2 is a lot nicer then the first trainer that I purchased. I purchased the Cycleops trainer about two months ago and have been only using it for 1-2 hours a week. So far it has been quiet enough to listen to music or watch TV while riding with the volumne low enough not to bother the rest of the family at home. The only comment that my wife made was that she could hear a humming noise from the next room. Instructions were adequate by using both the written instructions and the pictures to figure things out. The resistance felt natural and gave me a good workout. Mine started leaking somewhere after about 6 Mos. and cycleops wants money to replace resistance unit. not very good. Wanted a trainer to rehab after knee surgery and then stay in the saddle in the winter months. One absolute requirement - since it was going to be in the house (and we have no basement) it had to be quiet. Complete success. Wanted to buy a cheaper model but the noise difference is significant and my wife is completely satisfied on that end. The fluid 2 is simple to set up (even for me) and replicates a smooth cycling workout. It's up to you to vary the workout - shift gears, interval train - to get the most out of it. And my timing was great, if you want to call it that, given the impossibility of getting the bike out on the road for what seems like forever here in Massachusetts. I've used it more than I'd expected and am getting some good work in. I don't have a ton of experience with different kinds of trainers but I have been very happy with the Fluid 2. It's smooth and easy to ride. Connecting and disconnecting the bike is simple. It is also quiet enough for me. Bought the Cycleops Fluid 2 to replace an old trainer, and I can't believe the difference! It is easy to set up the bike and the ride is super smooth. My wife also appreciates that it is quiet.